Bellasi was a Formula One constructor from Italy that raced under Swiss nationality. They participated in 6 grands prix during the early 1970s, entering a total of 6 cars. 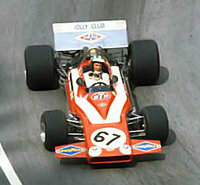 Guglielmo Bellasi was one of several car manufacturers to try to establish themselves in the Italian Formula 3 circles in the late 1960s. The first Bellasi F3 car appeared in 1966, entered by Scuderia Inter Corse and driven by Guglielmo Bellasi himself. This Ford-engined machine clearly had some potential as it finished third in the Circuito del Lago di Garda race a month later. Bellasi F3 cars appeared again in 1967 with Bellasi and Sandro Angeleri driving on occasional outings but there was a more concerted effort in 1968 with Scuderia Jolly Club running as many as four cars for Angeleri, Pino Mariella, Franco Conti and others. The best result was a fifth place for Mariella in the Coppa Autodromo at Monza. Similar cars continued to be seen in 1969 with Georges Ferreira, Pino Pica and Giorgio Pianta among the drivers. For 1970 Swiss racer Silvio Moser commissioned Bellasi to design a Grand Prix car for him. This Cosworth-powered device (using some components from the Moser Brabham BT24-3 had raced for the Silvio Moser Racing Team SA) was ready for the Dutch GP in June but failed to qualify there and again in France. The team did not bother to go to Britain because there was no starting money and there was another failure to qualify in Germany before Moser finally made it onto the grid at the Austrian GP. The car lasted 13 laps before breaking down and at Monza it was back to non-qualification. The car reappeared for the non-championship Argentine Grand Prix in 1971, entered by the Jolly Club. In September the car popped up again at the Italian GP and qualified but retired after only five laps.